Sound meditation can offer powerful rejuvenation and deep relaxation. 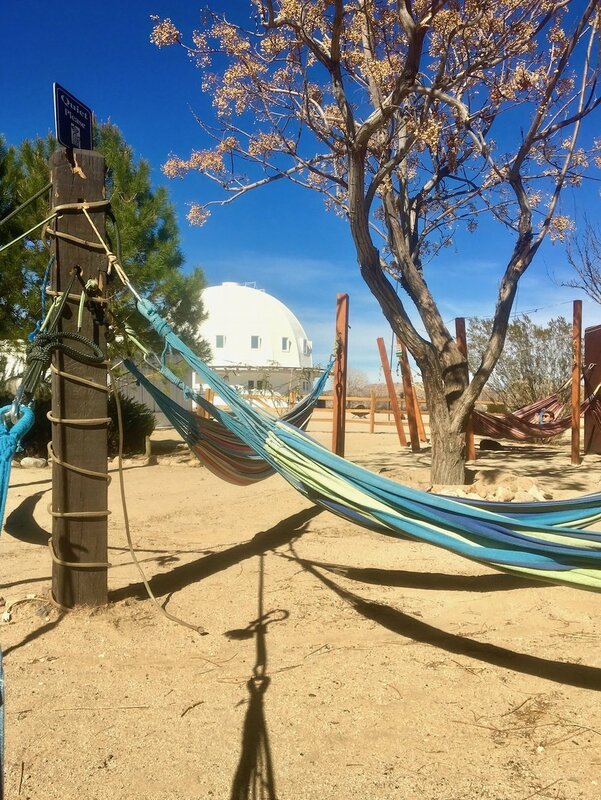 The Gravatron outside Joshua Tree is a great place to experience an immersive sound bath. Last week I shared some tips and benefits for meditation that didn’t involve sitting cross-legged on the floor. 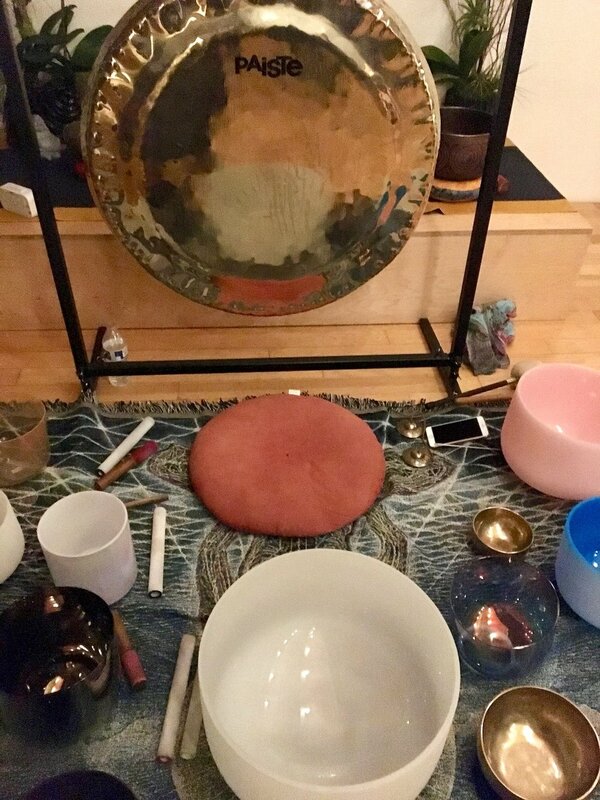 This week I want to talk about yet another meditation technique, sound meditation, and my experience doing a sound bath at The Integratron in Landers, CA. The Integratron is in a remote corner of the Mojave Desert, about 20 miles from 29 Palms and Joshua Tree National Park, and 40 miles north of Palm Springs. Without traffic, you can drive to Landers from Los Angeles in about 2 hours and 20 minutes. Construction of the Integratron first began in 1953 by aerospace engineer George Van Tassel after he claimed to have been visited by an alien. Stay with me here…or not. The alien evidently gave him a formula to rejuvenate cells using a special frequency that would also help with time travel. Yes, that’s a lot to take in, but that is how The Integratron came to be built. Well, it took 18 years to build, but it was all started by a visit from an alien. What makes this spot unique (besides being visited by aliens) is that it’s supposed to be set on a supercharged geomagnetic vortex. So that means that the energy is really high there due to several strong forces that all meet at The Integratron. Scientists have come in and measured off the charts magnetic fields on the land. I have a hard time wrapping my brain around aliens, but I am intrigued by the higher energy levels, so I went to investigate. I immediately began getting into a meditative state driving through the desolate, open land on my ride out to the sound bath. Eventually, I spotted the large white dome brightly standing in the middle of the dry, flat desert. 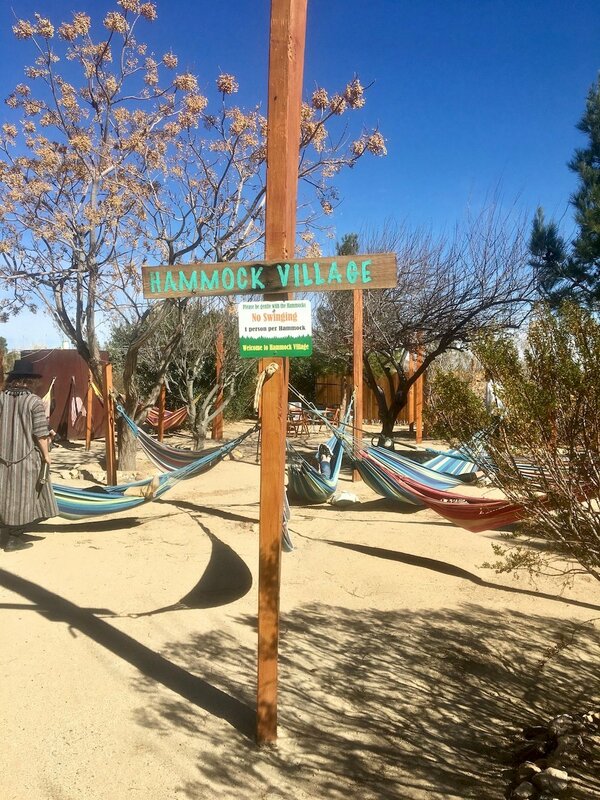 There are comfy hammocks and a chill sitting area just outside the dome to relax before or after the sound meditation. Be sure to bring a water bottle to drink in their supercharged, clean well water. The Gravatron building is striking, standing 38 feet tall and 55 feet around. It’s made entirely of wood, using an interlocking mechanism that requires no nails or screws. You must remove your shoes on the bottom floor of the Integratron before you walk upstairs. 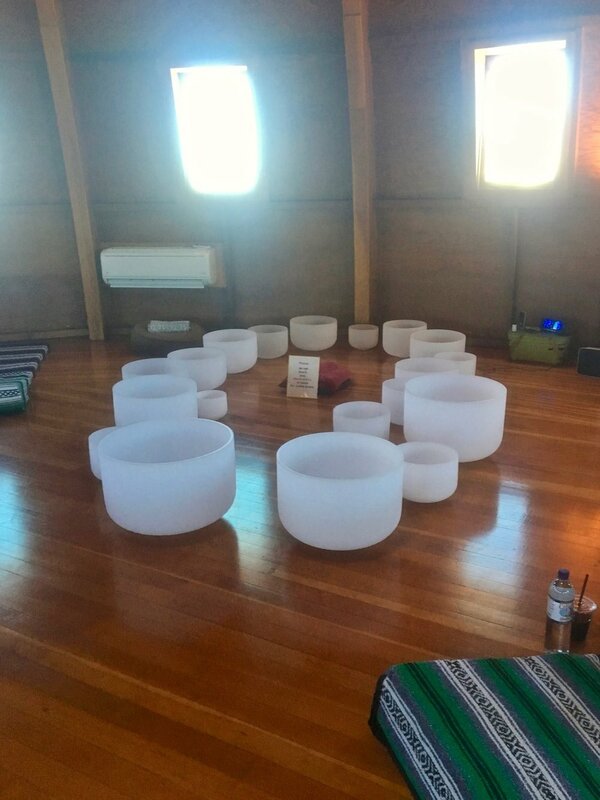 Upstairs is the meditation room where about 20 crystal bowls are arranged amongst a circular grouping of blanketed cushions. You pick a cushion, grab some blankets, and lay down for the meditation. Each crystal bowl is tuned to a specific note coinciding with a chakra, or energy center in the body. The bowl player gave a short introduction where he explained the history and what to expect during our sound meditation. He tested one bowl with a quick swirl around and tears immediately filled my eyes. I was slightly perplexed at the involuntary reaction. Our guide told us that this bowl was aligned with the heart chakra. I wasn’t sure what I was going to be in for, but I laid down to take in the whole meditation. The bowls were played for about a half hour as everyone lay silently on their mats. The sounds are very powerful at times. Sometimes it feels like the bowl music is emanating from inside of you or on top of you. The acoustics in the domed room allow the sounds to fill your whole body. I could hear some of the sounds go in one ear, travel across my head, and go out the other. My legs twitched and ached, which I learned can be a typical response to the bowls. That’s the sound energy releasing stress or anxiety. A lot of unhelpful things can get stored in the muscles and body. Sound meditation can help release these stored negative thoughts and feelings. While I was meditating, I saw lots of bright lights and colors. My mother who passed away nearly 10 years ago did a quick drive by, but mostly I felt an overall calm and relaxing state. It’s pretty hard to think of much else when the powerful sounds are playing. Sound can help you release your thoughts on a deeper level, and drive you into a deeper theta brainwave state. That’s basically a much more blissed out space than you’re probably used to being in. This state allows you to drop down to another level where you can experience deep relaxation beneath your thoughts. Recorded music plays after the bowls finish and you’re able to stay another 15-20 minutes to soak it all in. This isn’t something you want to jump up and go after it’s over. I felt a little spent, but in a positive, rejuvenated way. Maybe those aliens knew what they were talking about after all. If sitting quietly in meditation is too difficult for you, as it is for many, then trying sound meditation could be another avenue to explore. Sound meditation classes are offered in many cities like Los Angeles and beyond. You can often find them in yoga and meditation studios. Sound meditation apps like Insight or Headspace have recorded sound meditations, but doing it in person is much more impactful. If you ever find yourself in Joshua Tree, and you really should as that’s a wonderfully meditative location as well, you should check out The Integratron. Make sure you book early though, as the sessions are usually sold out up to 3 months in advance. There can be last minute cancelations, so check back as that’s how I got in. Have you ever tried sound meditation? Would you be open to trying?